There are 4 stations for this review station lab. The more sets of stations you print out the smaller your groups can be. Students will rotate around the stations every 5-8 minutes depending on students readiness level over the concept. 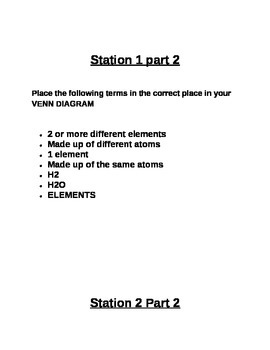 Students will use the Student answer document (listed free in my store) to answer the questions on the table. This is student centered and the role of the teacher is to guide them in the right direction for rotations and to answer misconceptions. Students will visit stations that help them analyze and determine whether a chemical formula is organic or not organic and well as what chemical formula represents and element or compound. Students will also see a visual representation of elements and compounds. The last station is over energy transfers and how energy moves through a food chain and pyramid. This used for review or you can take it out of the rotation if you choose.